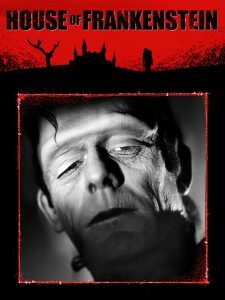 House of Frankenstein is the first of the Universal Studios monster mashes. In short, mad scientist Niemann and “friend Daniel” his hunchback assistant escape prison and enact a series of revenges on the people who had him imprisoned. They murder a proprietor of a travelling show of horrors, impersonate him and revive his corpse of Dracula. Dracula succeeds in the first part of the revenge scheme, but Niemann abandons him to be destroyed in the sunlight. Niemann then travels to the ruins of Frankenstein’s castle. He hopes to recover the dead doctor’s secrets, but instead recovers both the Wolf Man and Frankenstein’s monster. He revives them both, but a romantic triangle unravels the plot. John Carradine does a good job of portraying the suave Count, but his Dracula frankly isn’t that threatening. Friend Daniel is a cold-blooded murderer, and sycophant. Even so, the audience feels sympathy for him when Ilonka the gypsy girl ignores his affection in order to fall for the handsome Larry Talbot. A compliment to the acting ability of J. Carroll Naish. Boris Karloff does a good job of playing the mad Dr. Niemann. Doctor Gustav Niemann (Boris Karloff, Bride of Frankenstein, The Raven). A mad doctor — imprisoned for trying to transplant a man’s brain into a dog’s skull. But still highly dangerous, treacherous, and vindictive. The entire movie tells of his attempts to get revenge on the people that he believes has wronged them. Daniel the hunchback (J. Carrol Naish, Sahara, Annie Get Your Gun). Niemann’s faithful assistant – faithful to the point of insanity … until he falls in love with the gypsy girl. Professor Bruno Lampini (George Zucco, The Mad Ghoul, The Cat and the Canary). An innocent man, two travels with his “show of horrors” including the corpse of Dracula. He’s soon murdered by Niemann and Daniel, who then impersonate him … and have plans for Dracula. Dracula (John Carradine, Mary of Scotland, Invisible Invaders). Revived by Niemann to get revenge on his enemies … and left by him to “die” in the sunlight. Bürgermeister Hussman (Sig Ruman, A Night in Casablanca, Stalag 17). A nice fellow and family man, murdered by Dracula. The man who originally had Neimann imprisoned. Rita Hussman (Anne Gwynne, Flash Gordon Conquers the Universe, Weird Woman). Hussman’s newlywed granddaughter-in-law, mesmerised, who is mesmerized by Dracula. Carl Hussman (Peter Coe, Road to Bali, The Mummy’s Curse). Rita’s husband and Hussman’s grandson, determined to save her. Inspector Arnz (Lionel Atwill, Son of Frankenstein, Ghost of Frankenstein). The good inspector, who trails the various criminals. Larry Talbot (Lon Chaney, Jr., The Wolf Man, My Favorite Brunette). The reluctant Wolf Man, who still searches for an end to his curse … or his life. Despite the gypsy girl’s obvious affection for him. Revived alongside Frankenstein’s Monster by Niemann and Daniel. Ilonka (Elena Verdugo, Marcus Welby M.D.). The beautiful gypsy girl that Niemann and Daniel rescue. Daniel swiftly falls in love with her, but she instead falls in love with Talbot. This romantic triangle leads to tragedy all around. Inspector Muller (Philip Van Zandt, Citizen Kane, Musty Musketeers).